Tierna Morganna in Plane of Knowledge will be interested in seeing this item. 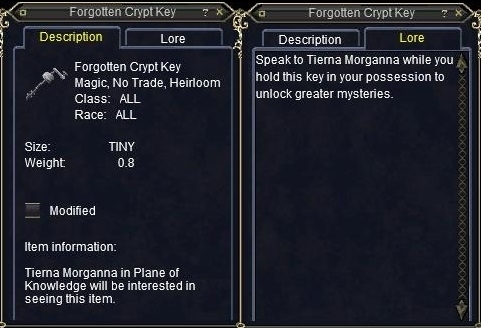 Speak to Tierna Morganna while you hold this key in your possession to unlock greater mysteries. Hailing Tierna Morganna in Plane of Knowledge (near the library wall between Franklin Teek and Brewmaster Berina) will offer a Group mission "Lair of the Risen" (6 hour mission) and entering the zone fulfills Dragoncrypt traveler achievement. The Forgotten Crypt Key is a single use item. Keyword to enter the zone and mission is "ready"
A reward chest spawns at the end of the Skaramatra fight, Opening the chest reveals a loot item, appears to be level 85 gear. Dropped from a blight speaker in Bloodmoon Keep. Got one in an Anniversary Quest! Just had one drop off "a basher" in an instance of Grobb. I assume it'll drop in actual Grobb too, but can't verify that. Just had one of these drop in Grelleth. Dropped in the 'Into the Temple(b)' mission in Demiplane of Life. Breeding Ground - A phase spider dropped this. Dropped off one of the elementals in this HA in the Endless Caverns. Not sure why a 95+ HA is dropping this. much to my surprise, dropped off a trucculent wasp in grounds, while I was doing daily HZ task. I had one drop tonight in Anniversary Group Task: Stealing My Life Back off a trash mob. Found this today in oldkaesorab on a stonefist master's corpse. This seems to have a rare chance to drop in any hotzone level 80+ as I just got one off a farmer in Valley. Feerot drop too in rare. I just got one from normal lizard in Feerot the dream. Just had one drop off a wild neya in Shard's Landing.